TourCert is a German organization specialized in certification and advice on corporate responsibility and sustainable tourism. 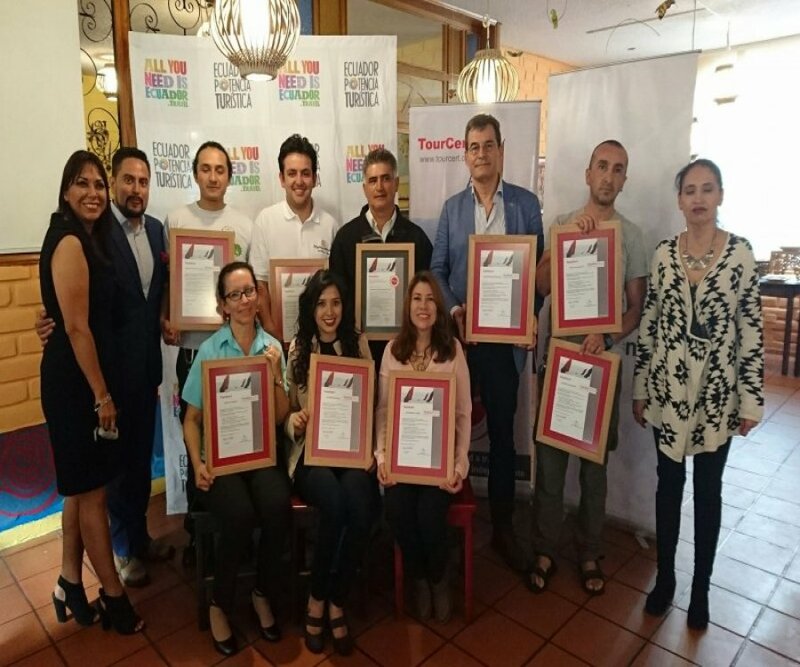 (Baños de Agua Santa, 08/02/2017) The Ministry of Tourism, at the destination Baños de Agua Santa, recognized the standards of quality, sustainability and social responsibility to 10 tourism companies for accommodation, food, beverages and tourist operations; Which successfully completed the international "TourCert" certification program. During the certification process, the TourCert team, in Baños de Agua Santa, carried out 2 group workshops on socialization and individual technical assistance, as well as a training workshop for officials of the Sustainable Tourism Directorate of the Decentralized Municipal Government of Baños. The recognized companies were: Hotel La Floresta; Hotel Spa Luna Runtun; Hosteria La Casa de Papa; Miramelindo Hosteria; Hostería Monteselva; Hostal and Spa Casa Real; El Cedro Restaurant; Geotours Cia. Ltda; Imagine Ecuador Adventure Travel; And Team Adventure. The benefits for tourism companies that have TourCert certification are several, such as positioning in international markets, implementation of a quality management system, permanent technical advice, tax benefits, presence and participation in international events generated by the Ministry of Tourism. Hans Ocaña, Director of Quality of the Mintur commented that "with this system of integral quality management, the results are being reflected within the tourist companies towards the customers", while he said that "the real challenge is to stay in the Time, continue to grow and make our country a preferred destination for tourists from all over the world. " Oliver Curat, president of Luna Runtun Adventure Spa, highlighted the initiative of the Mintur to implement this certification, as it considers that in addition to being a tool to motivate the staff and to allow effective operational management of the company, it is a competitive advantage, which Contributes to improving the image of Ecuador every day worldwide. " TourCert is a German organization specialized in certification and advice on corporate responsibility and sustainable tourism. In Latin America, Ecuador is the first country to implement this process of tourism quality.